Yes, Bradford is done for the season. Unlike David Hamilton, who would have been No.7 on our list, Bradford made a return this season. The Aledo, Texas native returned as the Big 12 Pitcher of the Year and won the 2018 Big 12 Pitching Title. He scored Co-MVP of the 2018 Big 12 Tournament MVP and was named as the 2019 Preseason Pitcher of the Year. He left zero doubt on the field last year. The 6-foot-3, 195 pound lefty tossed back-to-back complete game shutouts against TCU and Kansas State in 2018. In 96.2 innings, Bradford posted a sub 3.00 ERA and a sub 3 BB/9IP ratio. Additionally, he struck out more than eight batters per 9 innings. Bradford was, without a doubt, the best pitcher in the Big 12 in 2018. Sure, Janczak and Gingery went missing, but Bradford proved to be just as effective as both of them. 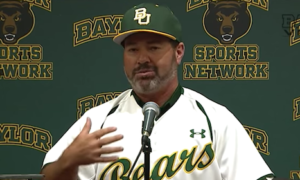 Without Bradford, Baylor doesn’t make the NCAA Regionals during a rebuilding season. Without Bradfrod,Baylor doesn’t win the Big 12 Tournament Championshp. Bradford was the glue that kept Baylor’s defense together. Now that he’s hurt, there is a big question. Does he return in 2020? Or does he take the money from the MLB Draft?